In Europe’s long struggle between the political establishment and its challengers, the momentum this year is shifting toward nativists, deepening doubts about the continent’s multilateral order and divisions about how to respond. German Chancellor Angela Merkel survived the near-collapse of her governing coalition this week by pledging to tighten immigration controls, backing further away from her pro-refugee stance at the height of Europe’s migration crisis, which continues to reverberate around the continent. Few in Germany expect the calm to last. The European Union’s most powerful member is also becoming its central battleground in a rancorous debate over immigration, sovereignty and political leadership. In Italy, the relentless rise of Matteo Salvini and his nativist League party is creating a new hub of opposition to Ms. Merkel and the multilateral Europe she wants to defend. Mr. Salvini, Italy’s interior minister and on paper the junior coalition partner in the Rome government, is dominating his country’s discourse with blunt rhetoric against immigrants and EU authorities. His open challenge to Ms. Merkel’s vision of Europe is emboldening politicians in other countries who want a looser EU, and to put their own nation first. Austria’s vice chancellor and far-right Freedom Party leader Heinz-Christian Strache said on Thursday he is “very thankful” for Mr. Salvini. “We agree with him on his positions on Europe, we have very good cooperation,” Mr. Strache told a news conference. “Bringing down the Berlin Wall seemed impossible. We will bring down the wall of Brussels,” Mr. Salvini said at the weekend, referring to the seat of the EU’s administration. 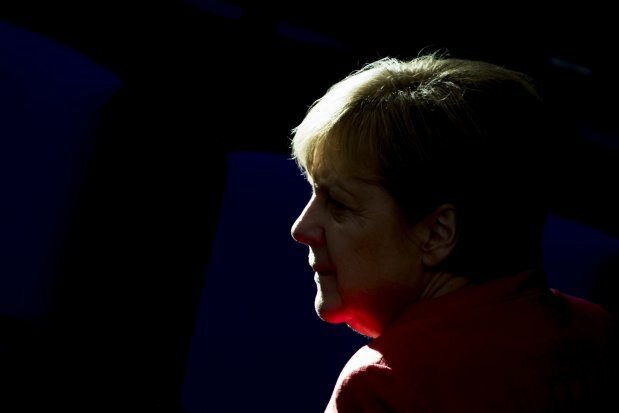 The challenge from the nationalist right is dividing Europe’s established conservative parties, including Ms. Merkel’s Christian Democrats, who helped build the EU and are now unsure how to defend it. President Donald Trump’s verbal attacks on the EU, as well as his questioning of the North Atlantic Treaty Organization and multilateral trade rules, are adding to the sense in EU capitals that the integrated Europe of the post-Cold War era is under siege. Some EU countries are even challenging the bloc’s norms on liberal democracy, with Hungary’s Viktor Orban saying he wants to build an “illiberal state” inspired by authoritarian regimes and Poland accused by the EU of weakening the rule of law. Central Europe’s nationalists, as skeptical about non-European migrants as they are about checks and balances, are becoming another schism within the EU, challenging the post-Cold War belief that Europe would converge on a single model of governance. “We are seeing a continentwide struggle about what we perceived as the permanent status quo, the multilateral order of the West,” said Ulrich Speck, a foreign-policy scholar at the German Marshall Fund of the United States. Austria, the small Alpine country sandwiched between Germany and Italy, has gained an outsize role in the struggle for Europe’s soul. Austria’s 31-year-old chancellor, Sebastian Kurz, has gone further than any other leader from the EU’s center-right establishment in co-opting the far-right in a quest to tame it, bringing a nativist party into his coalition and championing border controls as the only way to stop migrants and save the EU. On Saturday, as Austria took over the EU rotating presidency for six months, Mr. Kurz hosted some EU leaders on a mountain top. Surrounded by hikers wearing traditional Alpine garb, he lauded the “magnificent view over our beautiful country,” and promised to focus the EU’s agenda on homeland security. Mr. Kurz has aligned himself with Ms. Merkel’s German critics who want a migration crackdown. Only a year ago, EU supporters were celebrating the landslide election of fresh-faced French President Emmanuel Macron, who trounced a nationalist rival after campaigning for deeper European unity. Today, Mr. Macron looks like Europe’s exception, rather than the herald of a centrist surge. His proposals for revitalizing the EU, including with common fiscal policies to bolster the euro currency zone, have found few takers. Instead, questions of immigration and security continue to dominate European voters’ concerns, surveys show, and politicians’ attempts to shore up their support. Today’s pressure on Europe’s status quo from the nationalist right is as serious as the ideological challenge from the anticapitalist left after 1968, says Ivan Krastev, a Bulgarian political scientist and author of the book “After Europe,” focused on the strains in the EU. The challenge for mainstream politicians, as in the 1970s, is “how to integrate some of the legitimate concerns of the voters, without giving in to the extremes,” Mr. Krastev says. Germany’s latest drama erupted when Ms. Merkel’s junior partner, the conservative Christian Social Union from the region of Bavaria, threatened to pull out of her coalition unless she agreed to block migrants from entering Germany who have already registered an asylum application in another EU country. Ms. Merkel insisted that such cases should be handled only in agreement with neighboring countries, reflecting her belief that Europe needs a collective response to the heavy migration pressures from the poor and war-torn continents that surround it. Her CSU critics argue she is falling behind the zeitgeist. “In Europe and the world,” Bavarian regional Premier Markus Söder said last month, “the time of orderly multilateralism is being superseded somewhat by individual countries that can make decisions too.” German authorities “should think also of the indigenous population and not always just of Europe as a whole,” he said. The CSU fears losing its ruling majority in Bavarian regional elections in October, thanks partly to the rise of the far-right Alternative for Germany, which has garnered votes from Germans angry about Ms. Merkel’s decision in 2015 to take in nearly a million Syrian refugees. That decision continues to define Ms. Merkel in the eyes of many in Germany and Europe, even though Ms. Merkel has repeatedly tightened Germany’s immigration policies since 2016. The chancellor’s bruising argument and last-minute compromise with the CSU concerned policy measures that would in practice affect only a small subset of migrants. But the details mattered less than what Ms. Merkel symbolizes to her critics: a Germany that can’t control its borders. The CSU’s quest to show the public that asylum seekers can be refused entry to the country has created an awkward tactical alliance around Europe: between establishment conservatives who want a migration crackdown, and some of the nativist insurgents who want to destroy them. Hostility to Ms. Merkel binds them together, as well as a sense that the chancellor’s authority is waning. 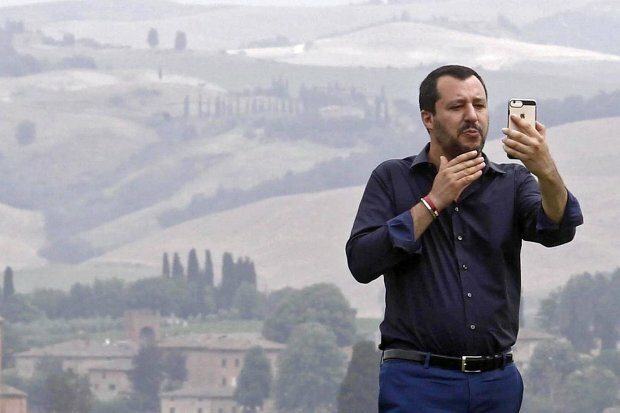 Mr. Salvini openly encouraged the CSU to challenge Ms. Merkel and push for unilateral border controls, even as he rejected taking back any migrants refused entry to Germany. At a raucous rally on Sunday of his League party, Mr. Salvini launched his manifesto for the year ahead, vowing to build a pan-European alliance of nationalist movements, “a league of leagues,” to sweep away Europe’s old political elites. “They accuse us of xenophobia, but the Italy that we will govern for the next 30 years…has no fear of anyone,” Mr. Salvini told the sea of flags.